Enter name and description for your route here. Select desired profile (Cessna 150 is default). You can add, modify and delete profiles using buttons on the right side of 'Profile' selection. 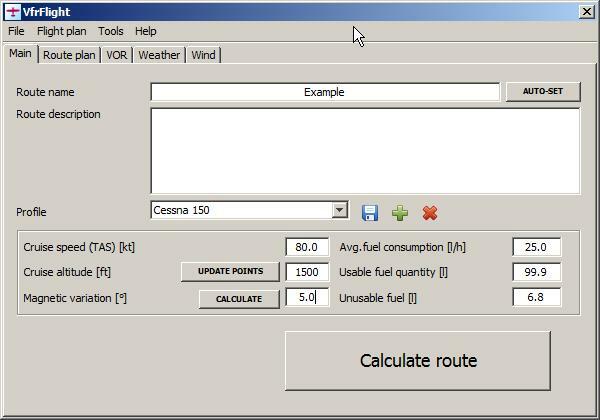 Profiles will remember cruise speed, cruise altitude and fuel values to save your time when creating new routes. Right mouse click anywhere over the map and select 'Add route'. 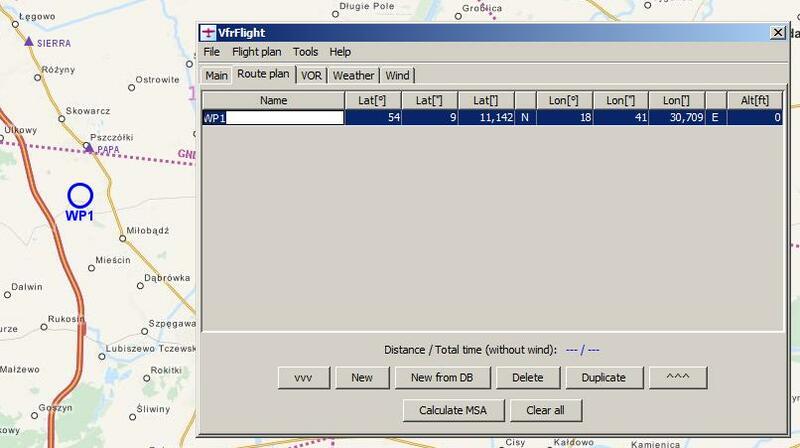 Enter route using ICAO codes for airports / VFR points / VOR / city names. 3 capital letters are treated as VOR. 4 capital letters are treated as airport. 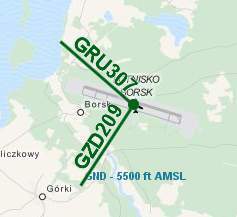 5 capital letters are treated as VFR point. Any other combination is treated as city. If any of the route points is ambiguous, additional dialog window will appear to allow you to choose desired waypoint. Right mouse click anywhere over the map and select 'Add point here'. New point will be added at mouse position. Drag point to desired position. 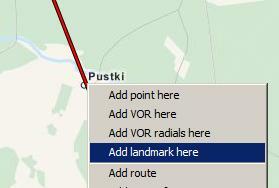 In main window open 'Route plan' tab, then double click on added point to change its name. Use '^^^' and 'vvv' buttons to change points order. Choose desired entry method - entering by degrees, minutes and seconds, or just by decimal values. To change those, right click anywhere on the table and and check/uncheck 'Show as decimal values'. Click 'New' button to enter coordinates from scratch or 'New from DB' to enter them from DB. If you need to enter coordinates from some document, you can copy them using windows text 'Copy' function and then after pressing 'New' button in 'Route plan' tab all coordinates will be pasted. Note that syntax needs to be like this 53°08'46''N 017°40'46''E. 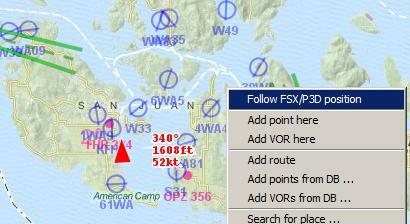 When you have 2 or more waypoints, right click over the map on route segment where you want to add VFR checkpoint. Choose 'Add landmark here'. Zoom in your map to comfortable level and drag created landmark to desired location (ie. road/river/railway crossing, lake, town). During calculation phase time needed to reach this point will be calculated and presented next to its position. Click this button in 'VOR' tab to search VOR along the route. You will be asked to enter maximum distance from segments. Right click anywhere over the map and choose 'Add VOR here'. make sure you unselected 'Enable mouse drag on map' in 'VOR' tab, to be able to drag it in the map. Choose desired entry method - entering by degrees, minutes and seconds, or just by decimal values. To change those right click anywhere on table and and check/uncheck 'Show as decimal values'. If you need to enter coordinates from some document, you can copy them using windows text 'Copy' function and then after pressing 'New' button in 'VOR' tab all coordinates will be pasted. Note that syntax needs to be like this 53°08'46''N 017°40'46''E. You can add any point or VOR, created by you, to your local database. Later, you will be able to search them when creating new routes. 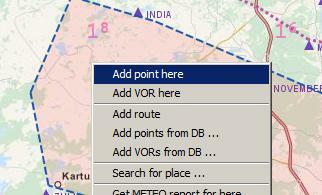 Go to specific tab, select points/VOR you want to add, right click and choose 'Add to DB'. 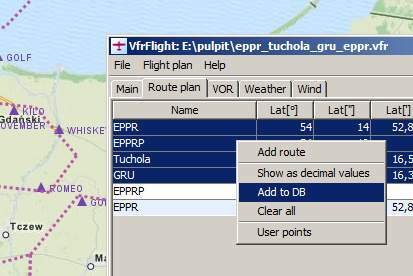 To control your points/VOR in local database go to menu 'Flight plan' and select 'User point'. New dialog window will appear and you will be able to edit, delete, export and import your points/VOR. If you need to get VOR radials from any position in the map (ie. 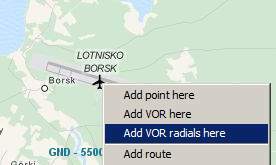 for alternate airports) you can do it using 'Add VOR radials here' after right clicking anywhere in the map. Dialog window will appear to choose VOR from list. For multiple choice hold CTRL. Click OK when ready. Radials will appear in the map. 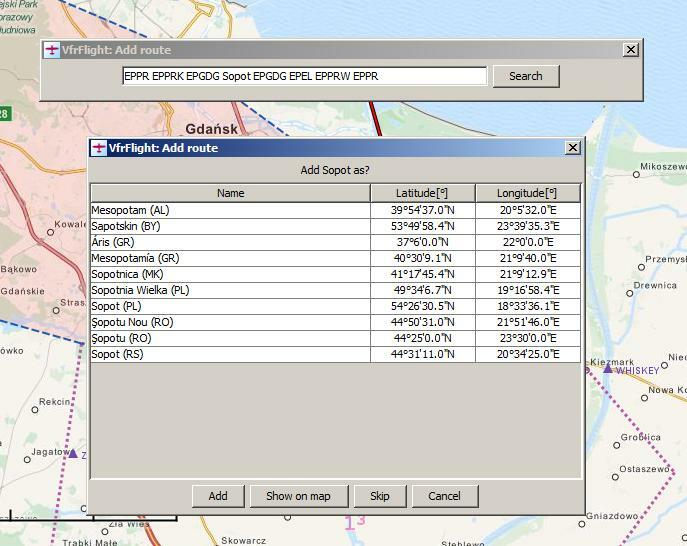 Click 'Search along route' button and check TAF/METAR and select maximum distance from your route. This will query NOAA database server and results will be given in the table. Select any row and click 'Center map on station' to see weather station position. 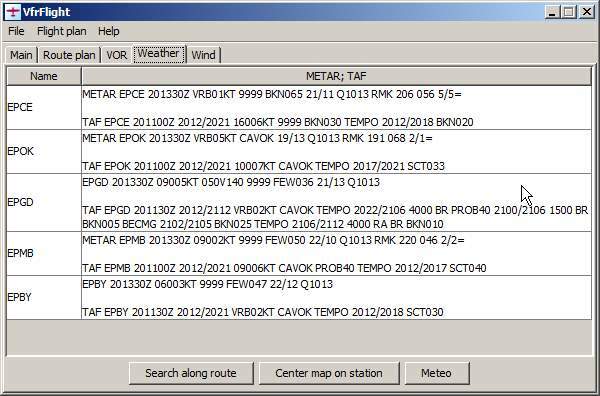 You can translate TAF/METAR to more human friendly form by selecting 'Translate METAR/TAF' from right click menu over weather table. 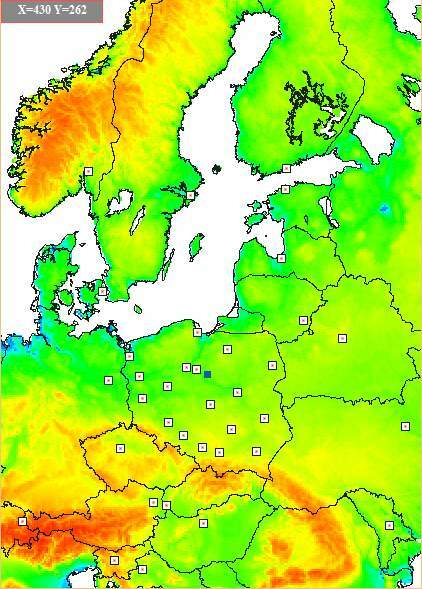 Meteo (http://meteo.pl) is weather service providing very accurate mathematical model to forecast weather conditions. Area covered by METEO is shown below. 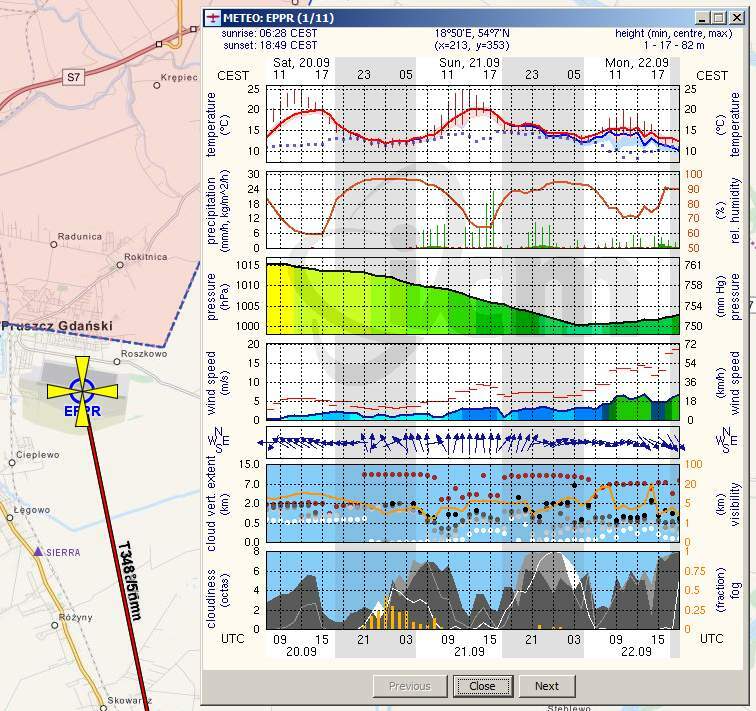 It is integrated in VfrFlight and you can get quite accurate weather data at any point in covered area. This allows you to check weather in whole route, not only at route waypoints. Clicking 'Meteo' will bring you dialog window where you can choose places en route to gather data. After clicking 'Search' all reports will be displayed. In 'Wind' tab drag wind cone to selected direction. Enter wind speed and press enter. Wind cone will appear in the map. You can freely drag it and change its position. 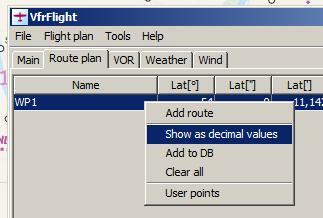 Click 'Calculate route' button in 'Main' tab, or select it from 'Flight plan' menu. New window with the results will appear. Data in the map will change a little. You will see magnetic headings in red color next to route segments. 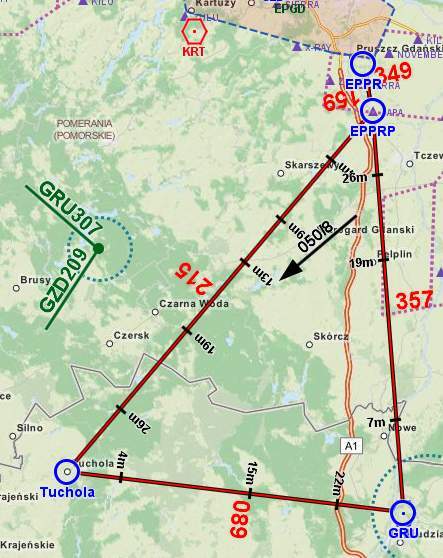 If you have added any landmarks / VFR checkpoints, time to reach them will be calculated and placed next to its positions. Place and hold mouse cursor over any column header to get the tool tip with more description. At the bottom of the window, you can find maximum WCA angle for given wind speed and cruise speed. You can choose to show 5 minutes distance marks on segments if needed. All waypoints are listed here as rows and all VOR as columns. Radials and diagonal distances are calculated. 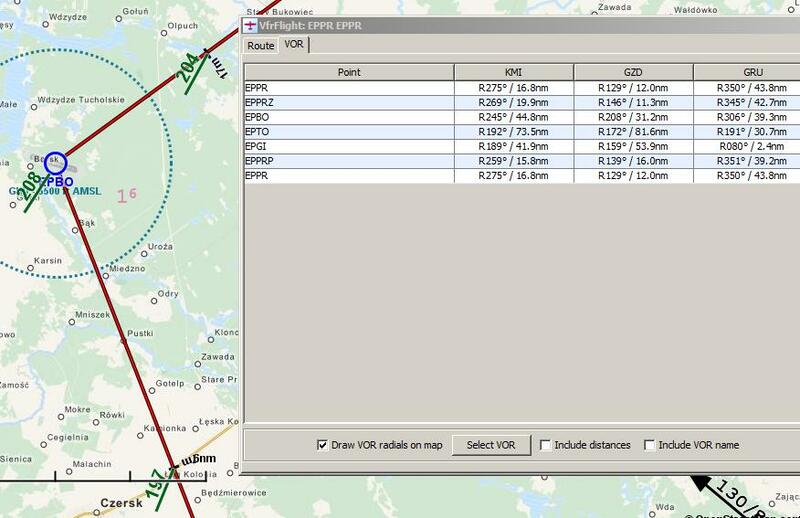 You can choose to draw radials directly on the map for selected VOR by checking 'Draw VOR radials on map'. 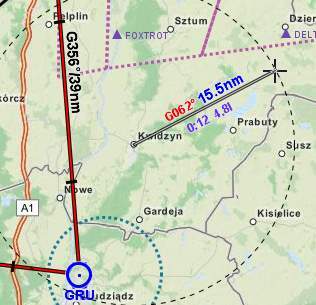 This will draw also radials for landmarks (VFR checkpoints). Please remember, that to calculate diagonal VOR distances you need to provide accurate altitudes for VOR and route points. 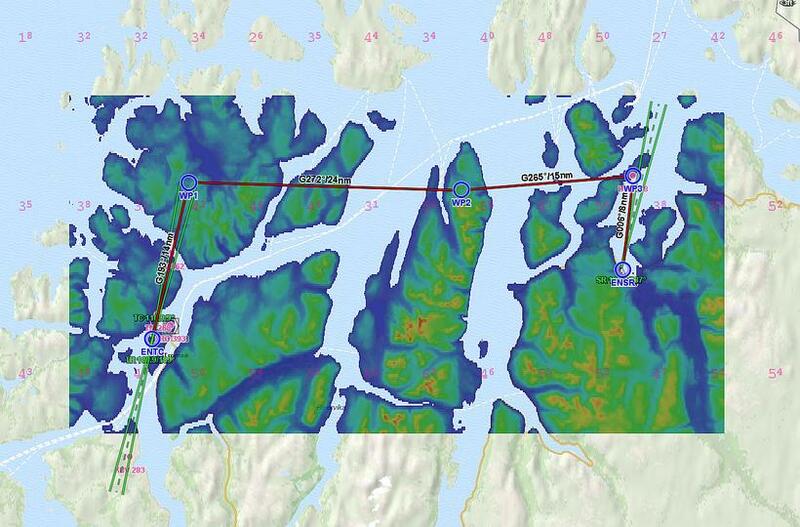 Radials on the map will have orange color if no altitude was provided. In that situation, distances will be calculated on terrain level and not as diagonal. This will export route to PDF / HTML. You can find more options to customize your PDF in menu 'Flight plan' / 'Settings' window. By defaults ruler is enabled after pressing and dragging middle mouse button (sometimes it is under scroll). You can also activate ruler by checking 'Enable ruler'. If you enter cruise speed and fuel data additional info about flight duration and fuel consumption will appear at the bottom. In some cases you can need ruler to stay on the map after you release mouse button. To do that, press SHIFT key just before releasing mouse button. There are 7 map types, and you can change them by selecting option from select box. 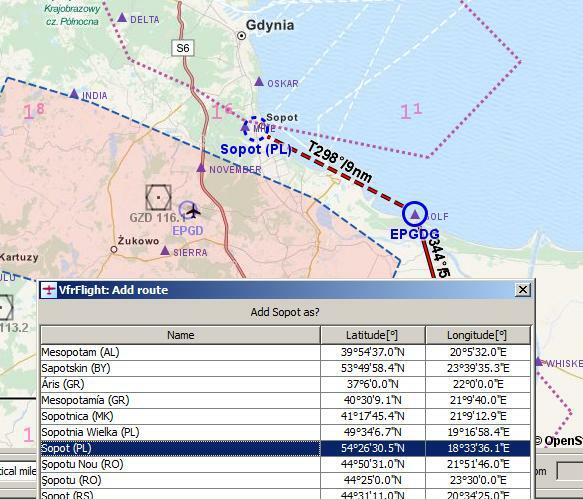 Currently there is some airspaces data for Poland only. You can choose altitude range for drawing airspaces, by entering bottom and/or top values. You can export current map with all data to PNG / PDF format by right clicking over the map and choosing 'Export map as ...'. Right mouse clicking over the map and choosing 'Show all...' will let you to select all airports / VOR / user points to be shown at once in the map. 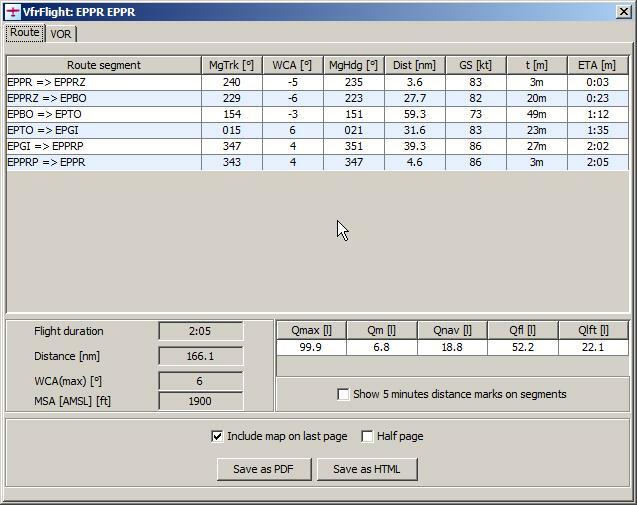 VfrFlight reads elevation data measured in NASA SRTM mission (HGT file format) and uses it in Terrain Layer and Vertical Profile Calculation features. The SRTM data is available as 3 arc second (approx. 90m resolution) DEMs. The vertical error of the DEM’s is reported to be less than 16m (~52.5ft). Extract archives somewhere on your disk. Folder structure is not important, both algorithms will search in every subfolder and look for *.HGT files. In some future update I plan to implement reading data directly from FSX/P3D. USE IT AT YOUR OWN RISK. You are Pilot in Command and you should decide on your own. Never plan your route altitude without sensible safe altitudes and don't relay on accuracy of elevation data provided by VfrFlight. Click right mouse button somewhere on the main map and select 'Add/Edit terrain layer' from popup menu. Resolution: lower values = higher resolution. Value of 1 is equivalent to the sample size of ~90 meters (depending of latitude). 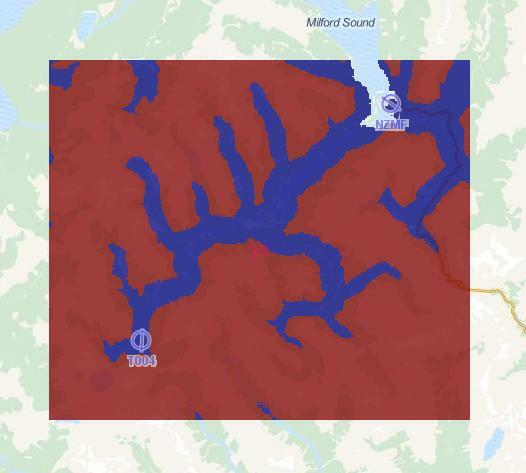 Values are odd numbers and represent size of the area from input data, which is resampled into a single visible rectangle on map. This is why radio buttons 'Calculate average value' and 'Find maximum value' are visible only when resolution is set to values greater than 1. 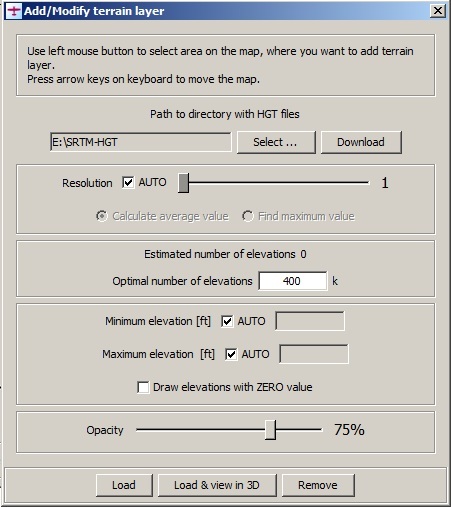 Optimal number of elevations is a threshold set by user for AUTO mode of resolution value. If you have some performance hit, you can lower this value. When you find optimal value for your system, you really don't need to worry about setting resolution value all over again. You can select either small area or entire country without changing any value (in AUTO mode). Minimum/Maximum elevations: when in AUTO mode, values here are the lowest and the highest elevations found and the colors range are spread along those. Some areas can be pretty flat with single high peak, so it could be better to set maximum elevation manually to have better contrast in the flatter area. Other way to use those settings is to set them for path finding. In example, if you set minimum value for 1500ft and maximum for 1501ft you get bicolored image - blue color represents elevations <=1500ft and red color >=1501ft (pictured below). Oceans and seas have elevations of 0, so for coast lines it is better to uncheck 'draw elevations with ZERO value'. To reduce performance hit of terrain layer, try new feature (in v1.3) of selecting smaller area for map objects visibility - open map context menu, 'Show all...', 'Selected area'. 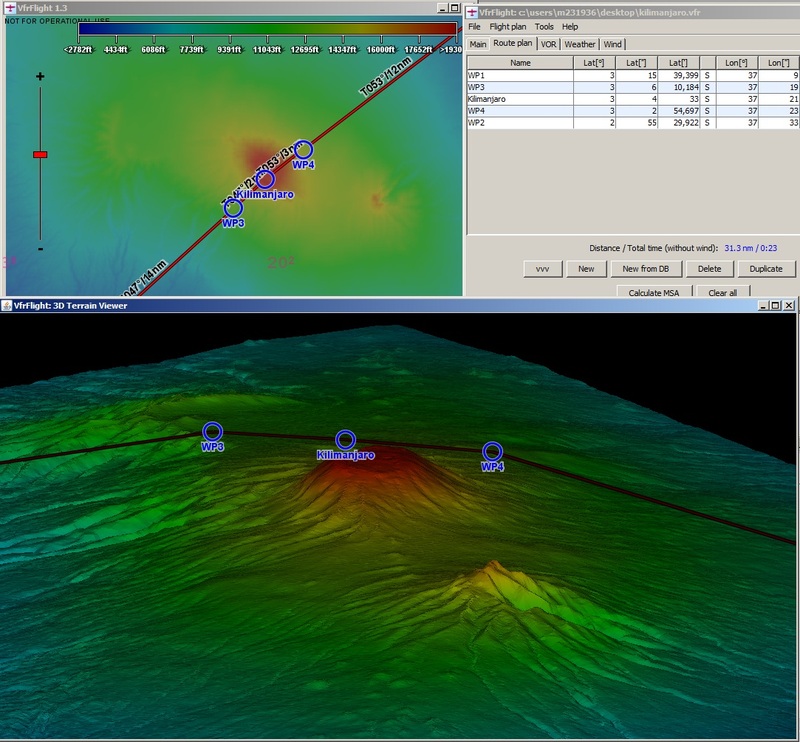 Clicking 'Load & view in 3D' button opens up a new window, where selected terrain is shown in three dimensions. Left Mouse Button or W/S/A/D keys moves terrain up/down/left/right. Right Mouse Button or Q/E/R/F keys rotates terrain relative to its center. Mouse Wheel or Z/X keys zooms view in/out. 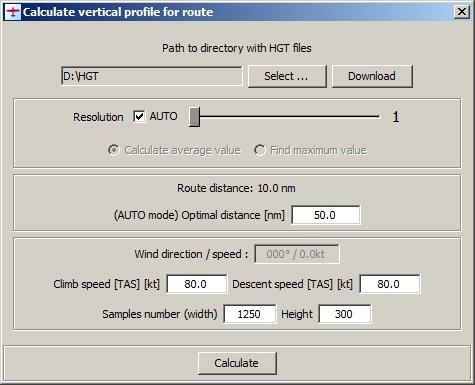 Click right mouse button somewhere on the main map and select 'Calculate vertical profile for route' from popup menu. Resolution: the same as explained above. Optimal distance: this is desired resolution in AUTO mode, which is calculated by dividing route distance by this optimal distance value. Climb and descent speeds are set automatically, if you have entered cruise speed. 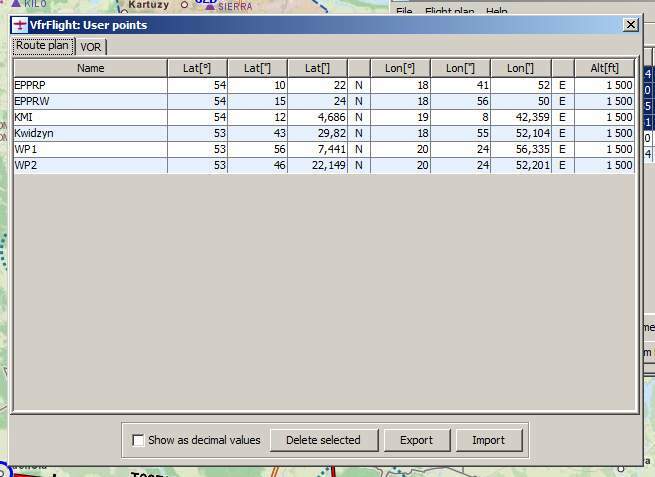 These are entered as TAS types, and on the next dialog Ground Speed for every route leg will be calculated with taking account of wind direction and speed. Samples number is basically width of resulting image. Lower number = better calculation speed. After pressing Calculate button, you will go to Vertical Profile dialog (below). Click RMB to bring up context menu. Use it to add new WPs, change altitudes or set some local options. Use mouse drag to change WPs altitudes and mouse wheel to zoom in and out. If you get performance hit in 'Show position on map' mode, try to reducing number of map objects in main map. You can export/import data to/from MS Flight Simulator X, Prepar 3D and Google Earth. 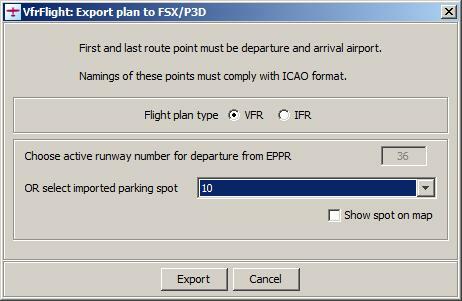 Select 'Flight plan' and either 'Export to' or 'Import from' option. Use feature "Import FSX/P3D data" from menu "Tools". Import will unlock more features: airport information dialog (available from context menu after right mouse click on the map) and ILS glide paths. Choose option "Flight plan" / "Export to" / "FSX/P3D" from main menu. Select flight plan type. If you have imported data from flight sim, you would be able to choose starting position from dropdown list. In the other case, you need to type in your starting heading on active runway. Click "Export" button and save PLN file. Then open it in your flight sim. In VfrFlight select option "Connect to FSX/P3D" from menu "Tools". If connection is established, new information text appears in the main window title. At this moment, map will not be centered on your position in flight sim. You need to right click on the map and choose option "Follow FSX/P3D position". If you have more than one simulator installed on your computer, you could need to configure connection according to description in pt.6.2. First, please check IP address for computer with FSX or P3D. In Windows you can do this by opening CMD shell and typing 'ipconfig /all'. For this example, let's assume that this IP address is 192.168.0.1. Please select some port for connection. I use 4506, but it could be reserved for something else on your PC. If you have problems, please select another port. Open and edit file SimConnect-example.cfg in the main VfrFlight directory. Change configuration entry under [SimConnect.0] and fill in values as show below (change IP address and port for yours). Change file name to SimConnect.cfg. It is important, because from that moment, this configuration will be in use. Otherwise, default values for local connection would apply. If the file is missing, create it and put the content as below. Please use IP address of computer with Prepar3D and port number that you have chosen. During flying lessons, significant amount of time is dedicated to practise simulated landings with engine failure. Flight Instructor cuts of throttle suddenly, and then Student Pilot executes emergency landing. VfrFlight enables to simulate those situations to improve your readiness for such failures. By defaults, this functionality is turned off. To activate it, open Settings dialog, choose 'FSX/P3D' tab and then 'SimConnect'. Move slider to the right to increase engine failure probability. 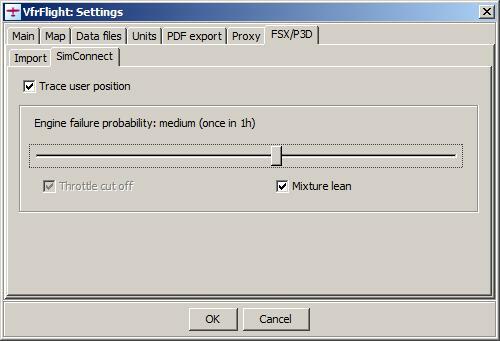 Two additional checkboxes describes nature of simulated failure: 'Throttle cut off' and 'Mixture lean'. First option is disabled and always selected. For flights below 500ft above ground level, failure probability is increased by factor of 5. This is supposed to increase number of difficult cases, where you need to act very fast.